Cycle Chic is off to Mexico next week for an event-filled calendar in the megaopolis. We'll be saying a few words at the opening of the Dreams on Wheels exhibition about Danish bicycle culture before Prince Joachim of Denmark cuts the ribbon. Then there's a lecture at a university before a wicked Cycle Chic party on March 6th where we'll launch Mexico Cycle Chic. From Il Uqi on Flickr. I found these brilliant photos from Mexico on Flickr and we're hoping they'll inspire a whole lot more as this cycle chic movement expands from Copenhagen to Mexico. So, it's time to get the Mexican fashion bloggers activated. The Polish fashion bloggers got together to produce a brilliant montage of photos that melted our hearts here at Cycle Chic. Let's see if Mexico can get rolling. 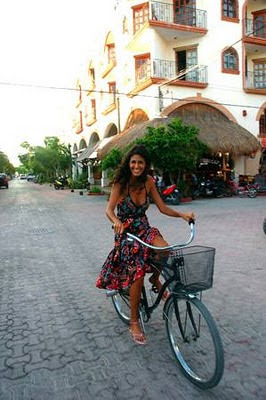 We're looking forward to some Mexican Cycle Chic on our visit. Watch this space. México just launched its public bicycle system called "ecobici" couldn't try when i was there since you have to wait around 10 days for your card to arrive, it isn't very very friendly for people who are visiting. Also, getting around the city is tough, there is not pedestrian culture, so I can't even imagine how it is riding a bicyle there, a lot of drivers are so wild and rude, I don't know if I would dare to cycle there. Hopefully things can change soon, i love seeing my homeland on the website! Hi, I am Miguel from México, again. I'm very happy that Cycle Chic is coming to México! México City in particular has now Ecobici, a program of the local government wich sadly IS NOT FREE. And the weekly Paseo Ciclista, where thousand of mexicans and tourists take on sundays the Paseo de la Reforma avenue on bikes. This is my petition to you: If you come and see any mexican government authority, suggest investing on streets or roads or whatever the name is for infraestructure EXCLUSIVELY FOR BIKES. Without this infraestructure, México City and its citizens will never go from being merely cyclist to be a part of a "mainstream bicycle culture" (using again your words). awesome. i'm scheming to get to mexico asap. thanks for a great site. I am jealous. I love Mexico! We Americans sometimes forget just how amazing Mexico is and only focus on the crap. I wish I could be there with you! Thanks for the post! I didn't know that you are coming to mexico. Invite me to the party! Saludos. 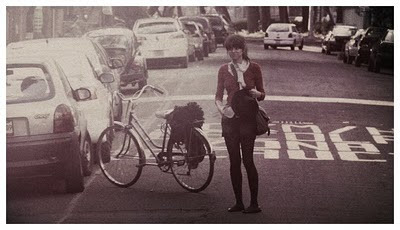 We welcome you Mikael - look much forward to have you in Mexico DF to spread the CycleChic concept and inspire the people of this mega city to show style, cycle and crawl out of the dead end traffic jam. 6 a 26 de Abril - Cuidad Universataria. For those who feel like riding a bicycle in Mexico City is imposible I want to invite you to try riding with Bicitekas. You´ll see that it´s possible and that there´s a lot of people doing something to promote respect for bicycle user´s in this big city. Hey, i have written in the past in this blog. I am glad you come here to Mexico City and would like to be part of this. Can you bring some stickers? I would like to buy one for my girlfriend!!! Bring on more hours of swooning over cycle chic! Can't wait for the Mexican inspirations to start flowing into my inbox! thanks for all the comments. i'm looking forward to coming! i'll bring some stickers, daniel. Can't wait for the exhibit! Hopefully, Mexico City will turn into a bike-friendly city. Wow. Thank you for posting this. I am Mexican and this means so much. 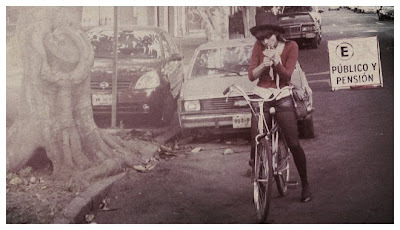 It's refreshing to see a beautiful tan woman on a bicycle. Give us some more exact information about places and time where you'll be... looking forward to meet you and ride (if possible) with you..! Oh what wonderful news! I am a frequent visitor to Mexico City and I must disagree with the poster who said it is a difficult city to ride in and that there is not a "pedestrian culture"! Of course there is! Especially downtown the streets are filled with pedestrians. Bicyclists are treated, in my experience, with a great deal of courtesy by motorists. They are considered to be legitimate users of the streets. And the ciclovia, particularly on the last Sunday of the month, is a huge and wonderful experience!! I am so pleased to watch Mexico City embrace the bicycle. It is a wonderful, wonderful city, full of life, art, joy, and beauty. There is a lot of progress to be made, but the bicycle is taking hold there.